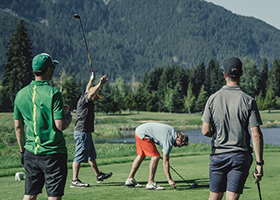 Family Golf Day at GolfBC is a great way to introduce kids and beginner golfers to the game, in a fun and relaxed environment - a fun event for the whole family, of all abilities! Kids! Bring an adult & you participate for free! Note - Family Golf Day may not be exactly as outlined above at each course. Contact the golf courses listed below for exact details. Register early, as space is limited! Simply call the golf course or download registration form. Furry Creek Not offered for 2016. Please refer to our Kids Play Free program, all season long. Cobble Hill Not offered for 2016. Please refer to our Kids Play Free program or our popular Junior camps and programs, offered all season long. Kelowna Not offered for 2016. Please refer to our Junior Golf programs for fun events all season! *One FREE kid per paying adult. Some conditions may apply; contact the golf courses for details.